Model and compare decimals using area models. Set the number of sections in each model to 1, 10, or 100, and then click in the models to shade sections. 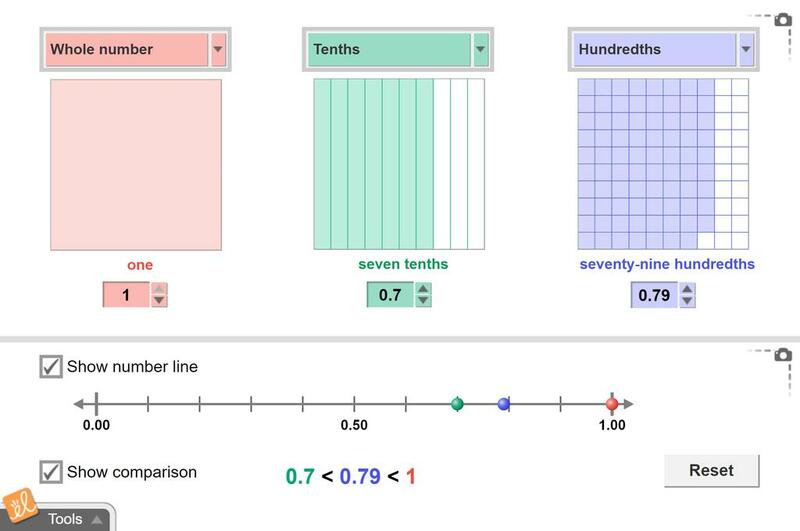 Compare decimals visually and on a number line. Understand that a decimal is any number written in the base-10 system. In common usage, the term "decimal" refers to a number that uses a decimal point to separate the ones place from tenths, hundredths, etc. Represent decimals using area models. State the fraction (tenths or hundredths) that is equivalent to a given decimal. Compare the values of decimals (tenths or hundredths) using area models and/or a number line. For example, compare the value of 0.8 and 0.21. Find a decimal that has a value between two other decimals. For example, find a decimal with a value between 0.3 and 0.4.